This past week Americans throughout the country celebrated National Welcoming Week by organizing events and festivities to promote the appreciation and understanding of unique communities in America. National Welcoming Week highlights the uniqueness and contributions of all immigrant Americans in shaping our country, our strength in diversity and the beauty of the American Dream. HIP takes pride in working with communities of all backgrounds and affirms the belief that robust diversity is essential to social and economic justice. 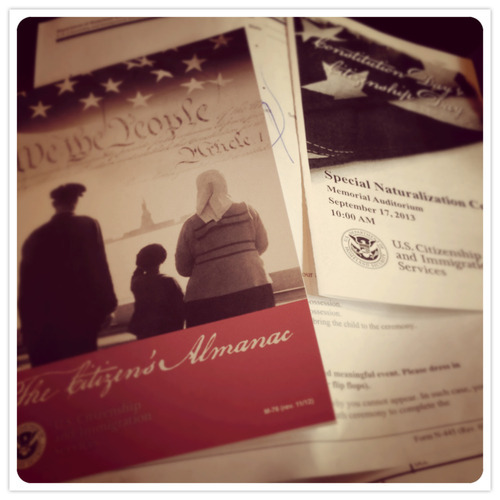 One of HIP’s very own organizer became a naturalized citizen and directly took part in National Welcoming Week. HIP Organizer Tong Thao, a Hmong refugee whose family came to the United States from Thailand in 1992, was among the hundreds of new Americans who stood and swore an oath of allegiance before the American flag at the Sacramento Memorial Auditorium on September 17, 2013.